The biggest change occurred in the second quarter, when the consumption of hard coal decreased by 24 per cent from the previous year. In the last quarter of the year, one per cent less hard coal was consumed compared to the corresponding period in the year before. 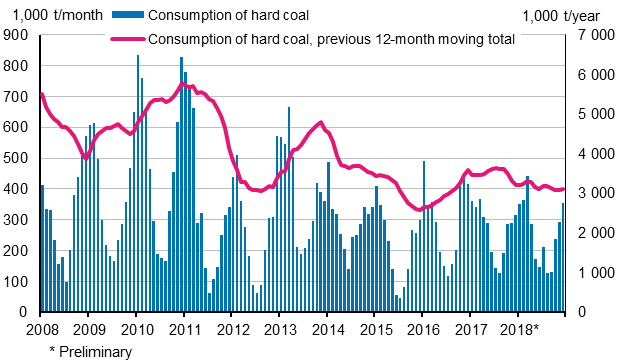 Hard coal consumption in Finland typically fluctuates seasonally. Some of the fluctuation is explained by the natural variation in the need for electricity and heat between the summer and winter seasons. The difference between statistical reference years is explained by variations in the demand for heating energy and the Nordic water situation, which particularly influences the electricity exchange price and thus the consumption of hard coal in separate production of electricity as well. Therefore, long-term consumption development cannot be deducted from the change in hard coal consumption in successive years. At the end of December, stocks of hard coal totalled 2.1 million tonnes. Compared with one year back, the stocks were six per cent lower. ISSN=1798-2588. December 2018. Helsinki: Statistics Finland [referred: 26.4.2019].